Applications: Stripping, cleaning, de-rusting metal. 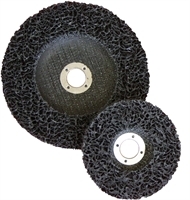 These backed discs used on angle grinders are ideal for fast work on larger surface areas. Applications range from boat hulls and car underseal to structural steelwork. Product Notes: Available 22.2mm bores. 115mm size will fit almost all standard grinders in sizes 115, 125, 180 and 230mm. Use 180mm discs in 180mm or 230mm grinders. Use correct eye, body and dust protection. These discs shift coatings fast! Also Available: Stripping discs are also available in shaft mounted for for edge-on use. Lockit system discs are also available.